Job Opportunities in Syriatel! 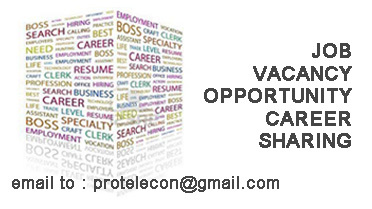 Vacancies: • Radio Engineer: Swedaa https://goo.gl/gsLdSi • Transport Planning Access-MW Engineer: Damascus https://goo.gl/ZMeCQt • Sites & Renewable Energy Deployment Engineer: Hasaka https://goo.gl/QOYTy2 Qualifications: Bachelor degree in Telecommunication or an equivalent to it. To apply, please visit: www.syriatel.sy/join-us All applications will be treated with strict confidentiality and only shortlisted candidates will be contacted for an interview.